Sometimes, there's nowhere suitable to hang or attach your banner. This is where a banner frame system comes in use. A great addition to your promotional armoury, a banner frame system can be used at events, exhibitions, conferences, even outside your premises. What is five + 8? Do you take part in outdoor community events, the local village fayre, or school fête. A banner system is the answer. Either that, or some of our feather flags and teardrop flags. These banner frames are available both single sided and double sided. They are heavy duty and portable, and made with white powder coated steel, making them suitable for frequent outdoor use. They have a sturdy A frame design. The sizes of system indicate the size of the banner they accept, not the size of the frame itself. Supertube banner frames are constructed from high-impact PVC/ABS, making the banner frame extremely robust, yet incredibly light weight. Perfectly portable and able to withstand the elements when used outdoors. The Supertube system can be used single and double sided. It stands upright, rather than A frame, like the Heavy duty banner frame above. 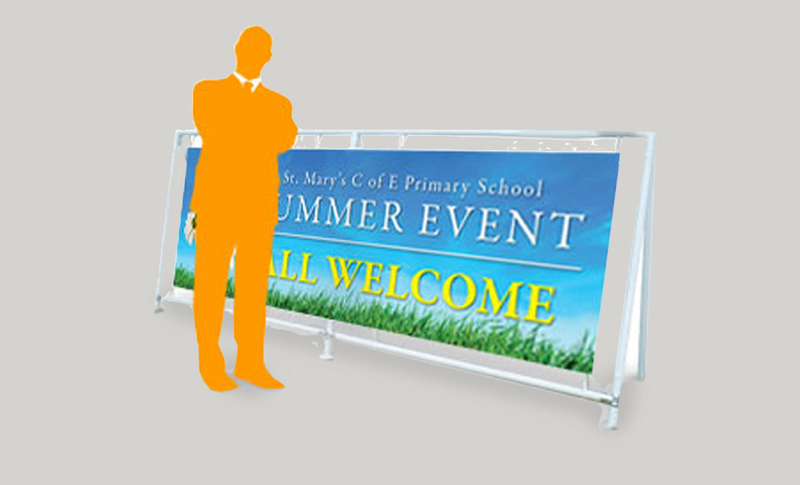 Recently, we have see in rise in outdoor promotions making use of a popular portable/temporary fencing system. Heras fencing is the large mesh panels used on building sites, festivals and outdoor events, as a security measure to keep unwanted visitors out.. When constructed as a triangle, it makes a very good banner frame system, which can safely be left to do the promotion for you. Ideally, on a flat area, but a lot of passing traffic. Arrange the bases and panels into an equilateral triangle, ensuring maximum traffic to the sides where the promotional message will be. Lay each panel on the ground, and fix to it, the promotional banner (ideally these should be hemmed and eyeletted at every 25mm - that a lot of cable ties). Once the banner is securely fitted to the Heras panel, slot it back into the base, and bolt to the adjoining panel, in two places (with the two bolts). You may want to consider using the other 2 sides of this system, to sell to advertisers who would be happy to pay for exposure to the passing traffic. In our experience, a Heras system can be funded by advertisers. One main promotional event banner and two sponsor banners. This can cover the cost of hiring the Heras and the printing of all three banners too. Cost neutral.